The breathtaking view of the Grand Canyon of Verdon in the Alpes de Haute of Provence in France. The Grand Canyon of Verdon or Gorges du Verdon in the Alpes de Haute of Provence, France, cannot match the size of its American counterpart but the spectacular wild beauty cannot be surpassed. The Gorges du Verdon is 21 kilometers long, can be as deep as 700 meters and is a natural boundary between the Alpes de Haute and the Var.The Gorges du Verdon in Provence, France was formed millions of years ago as the Alpes were developing and the limestone rock was eroded by the Verdon River rushing through the canyon.The Verdon River courses through the Gorges du Verdon in the Alpes de Haute of Provence and experienced rafters enjoy the sometimes dangerous 8 hour trip. The route through the steep rock walls is not for the feint-hearted because once started there is no stopping until the lower end is reached.Grand Canyon du Verdon, Gorges du Verdon and the Verdon River, Parc Naturel Regional du Verdon, Alpes de Haute, Provence, France, Europe. 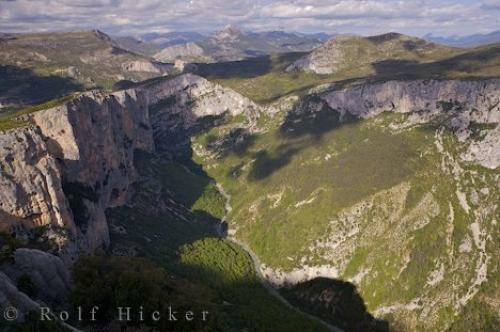 Photo of the Grand Canyon of Verdon, Gorges du Verdon in the Alpes de Haute of Provence in France.